Featuring favorite ethically-made Indigenous, South African, Muslim, and Chicago-based designers and brands. For the minimalist and/or pattern-crazed. 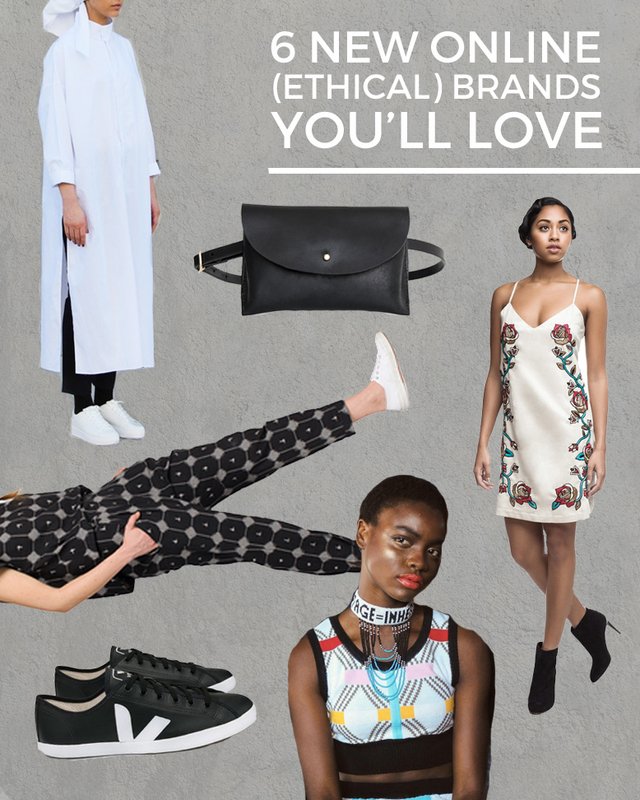 This post has been in-demand for quite some time, so please excuse the belated publish -- ever since our 6 (Ethical) Brands You'll Love as Much as Zara piece went viral (thanks for that), a good percentage of our inbox has now been filled with desperate asks and pleas (blame the Persian in me for the dramatics) for more ethical brands to support. Of course it makes sense that cute-as-hell ethical brands are not always the easiest thing in the world to find--a brand that is spending money on its garment workers and still has competitive prices probably doesn't have too much money leftover for advertising or social media marketing. So let us social media and Instagram fiends do the heavy lifting and research for you. I mean, it's one of the main reasons why JooJoo Azad exists, after all. But, let it not erase another reason why we're here: first and foremost, as an anti-capitalist fashion blog, we're here to say minimalism still trumps (I don't think I'll ever be able to use that verb now without rolling my eyes...) consumption. (more on what we're talking about when we say minimalism here, since it has been a sweet minute since we've written on this topic) But I get it -- we still need to have clothes on our backs, at the end of the day (and show our appreciation of people through the capitalistic tendency of gift-giving), so similarly we at JooJoo Azad are still, at the end of the day, responsible for providing ethical alternatives to the destructive forces of the fashion industry we are at war with. So let's start this post, already. Today we're sharing 6 of our current favorite ethical brands we've been oogling (new to the blog, not necessarily new to the internet)-- for the (aesthetically) maximalist & minimalist -- because God knows I can't be a moderate. + Subhi Taha | Taha's collection just recently dropped -- and never has there been anything more clean or modest. Think crisp, monochrome, light, and structured. Bonus points are (unbiasedly of course) given here because Taha is a young Muslim designer (and this is his first collection!) and that all his clothes are non-gendered. So that's something to celebrate -- and value -- Taha's prices are both wholly transparent & reasonable. + Matter Prints | a repeat from our last ethical brand compilation, but that's just because they are that good -- and came out with a new collection! (Which is a big deal when we're talking about slow-fashion, i.e fashion that is thoughtfully & mindfully made). We published a little shoot together with their ethical jumpsuit collection in the fall, and thanks to the magic of layering still get to wear their super-soft, ethically-made prints deep into the winter too! The Zalya Arrows hold the story of the brave and fearless. When you wear these prints, know that you carry these legacies with you too. + Veja | a non-sneaker wearer featuring a sneaker brand should tell you something. Well, it tells you two things actually: that maybe I've finally decided to stop wearing heeled boots in ice storms because I keep falling (friends on snapchat got to hear about that already), and that Veja is everything that a pair of shoes could ever need to make me wear sneakers: aesthetics, ethics, & comfort. I recently snagged a pair (by way of friends New Classics Studios) and yes, they feel as good as they look. + Maxhosa | straight outta' South Africa, Maxhosa is everything that is cool, vibrant, and full of energy. Just looking at their clothes gives me life (because that is what fashion is for after all, right?). While shipping costs to the USA might not be the most life-giving number, at the very least, you're going to have to follow their instagram because that is one hell of a mood board. + ByYellowTail | remember our piece on ways to support the #NoDAPL Water Protectors? We're going to add this one (a recommendation from Leah) to this list of Indigenous brands that are beautiful & political & ethical & completely swoon-worthy. This dress looks like it was made from my dreams. + CHC | fanny packs are still cool, I promise. Especially when they are as cute as this. And made from leather. That is ethically produced. (oh and cut & assembled here in Chicago)! P.S. Only a few more days left to apply for the paid winter '17 JooJoo Azad internship! Positions available now. $20-$50 an hr. No exp needed.